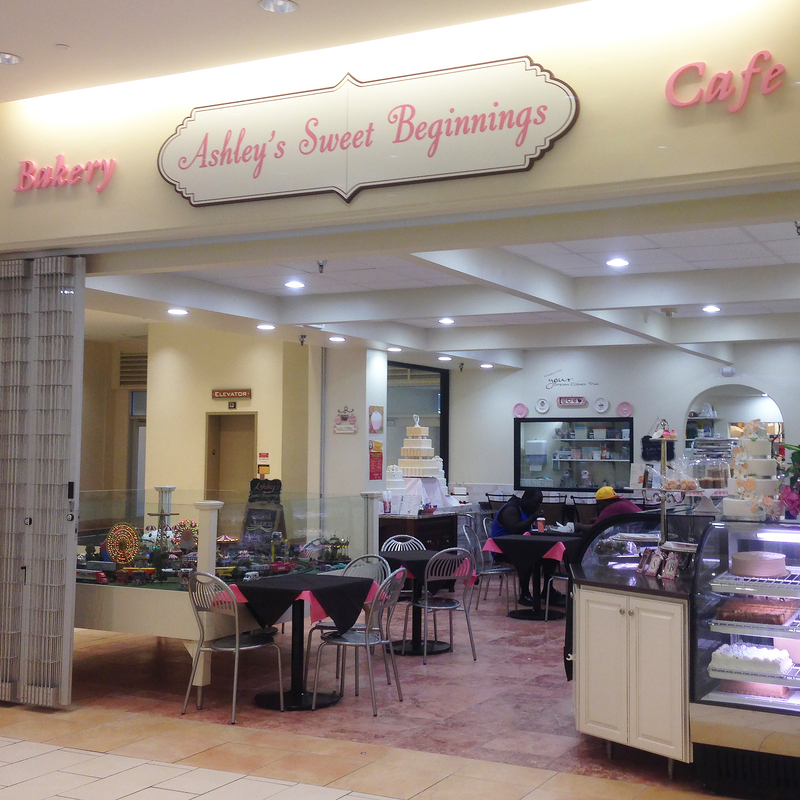 Today we are posting a “Throwback Thursday” review because it was almost a year ago that we first visited Ashley’s Sweet Beginnings (located in the Shops at Kenilworth in Towson, Maryland), but we never shared our thoughts. At that time, they were preparing for their grand opening, but were still opened for business, so we grabbed a variety of treats including cupcakes, macarons, truffles, and coffee. Ashley’s serves Zeke’s Coffee, which is a local Baltimore favorite, so we were already off to a good start. 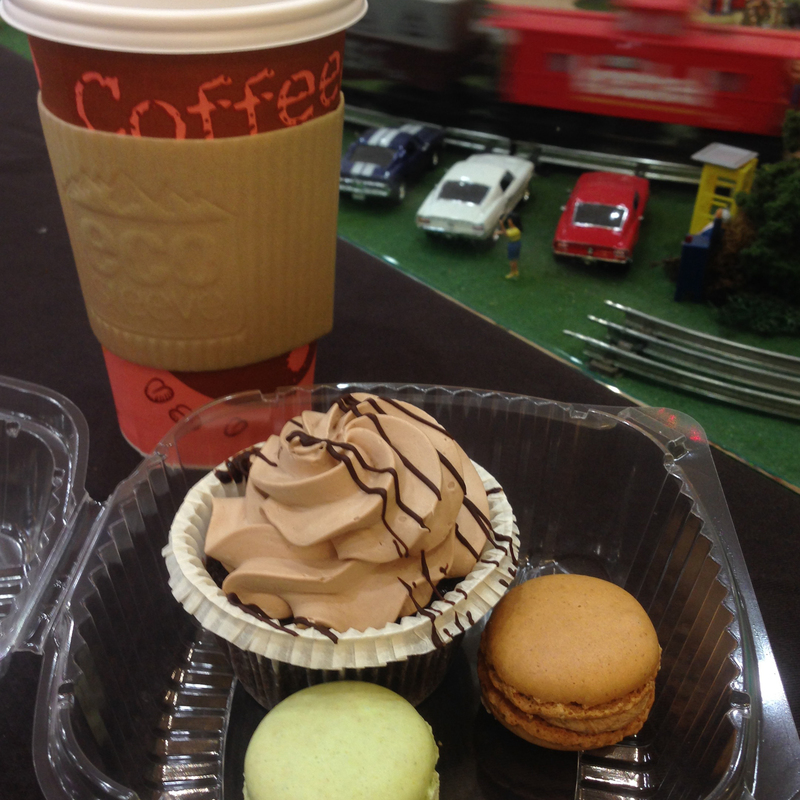 Along with her coffee, Crusader Jenn ordered the Triple Chocolate cupcake, a coffee macaron, and an pistachio macaron. Unfortunately Ashley’s refrigerates their cupcakes, which isn’t the best way to enjoy them while sitting in the cafe (we prefer our cupcakes at room temperature). Jenn still enjoyed the dense fudgey dark chocolate center and said that even though it was cold, the cake was still relatively moist, but it was just your average chocolate cake. The buttery chocolate frosting also would have been a nice balance to the dark chocolate center, but because the cupcake was cold, it was a bit on the hard side. Like Jenn, I ordered one cupcake and two macarons with my coffee, but instead of being different, I selected the same coffee and pistachio macarons as her. However, I chose the PB&J cupcake and also included a chocolate raspberry liquor truffle with my purchase (which isn’t pictured — but it was delicious!). PB&J cupcakes are one of my favorite flavors, so the standard has been set pretty high for me. Overall this cupcake had really amazing, well-balance flavor, with the just the right amount of filling, but I think because of the refrigeration process, the cake was overly dry. It may have improved if I had let it get to room temperature. Even though the frosting was cold and a bit hard, the flavor was perfect and it had a nice creamy texture. Each cupcake was priced well at only $2.50. Jenn and I really love their macarons and have become repeat customers. They are miniature sized with a price to match at only $1.00 each, which means we tend to get a variety of flavors depending on what’s available. They always have a nice crumbly shell and light fluffy texture on the inside. 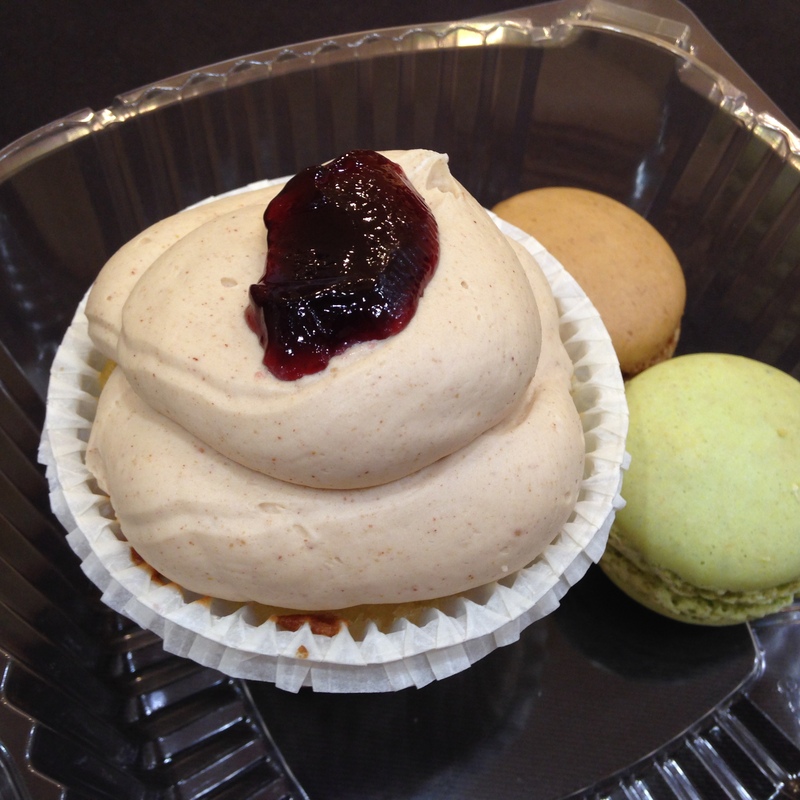 The flavor of the coffee macaron was a bit mild for me, but Crusader Jenn thought it was perfect, and the pistachio macaron had a wonderfully nutty flavor. Since then we’ve tried many flavors including lemon, raspberry, chocolate, vanilla, and more. I haven’t been disappointed yet! My suggestion to anyone visiting Ashley’s is to take your cupcakes to go so you aren’t eating them cold. If you are sitting and staying for a while, I would recommend selecting macarons, truffles, or any of the variety of other pastries they offer. Philly Cupcakes… And a HUGE Surprise! A few weeks ago my boyfriend, Mike, took me on a day trip and what I thought was just a fun adventure that included cupcakes, turned into something much more…and I’m happy to share with our readers on Valentine’s Day. 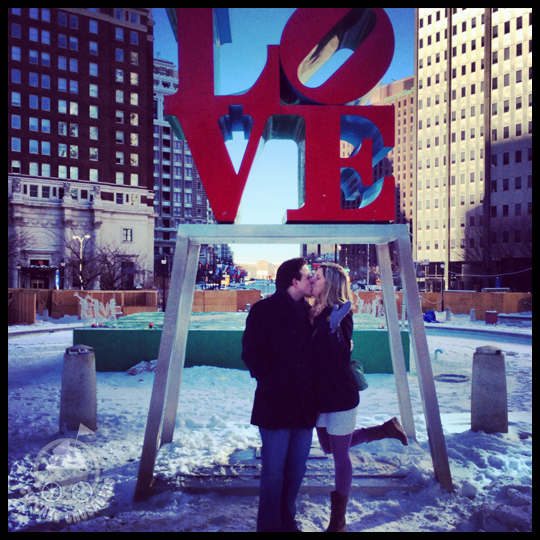 After an evening visiting Mike’s brother, Joe, for his birthday, and a lovely hotel stay in Collegetown, our fun day started in Philly at Love Park. This was Mike’s first timing visiting the park and seeing the famous Love sculpture, so we braved the cold and were lucky enough that a wonderful man who was clearing snow offered to take our picture. I don’t normally pose, but I’m grateful that I followed the man’s instructions because this photo couldn’t be more perfect! 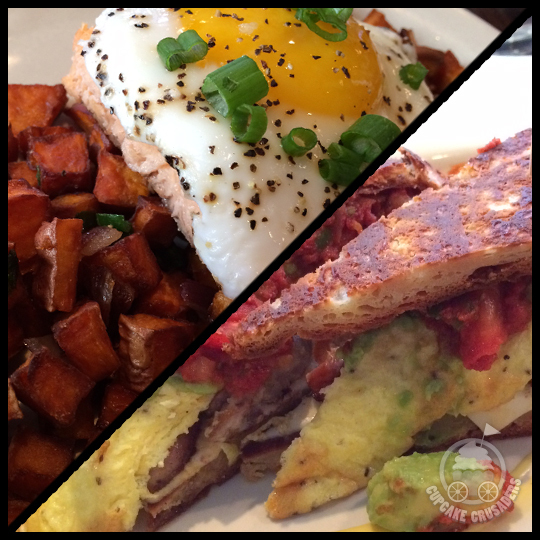 After a brisk walk, we found ourselves at Smokin Betty’s for some much needed brunch. Wow, the food and drinks were amazing and we felt as if we found a hidden gem! No meal is complete without a cupcake, so we walked over to the Reading Terminal Market to grab some from my favorite place in Philly; Flying Monkey Bakery! The market was packed, but I quickly picked a cupcake and found two seats in the picnic area. Mike ended up the the flourless chocolate cake, which he ate so fast I didn’t have a chance to take a picture of it, and I chose the chocolate hazelnut cupcake. 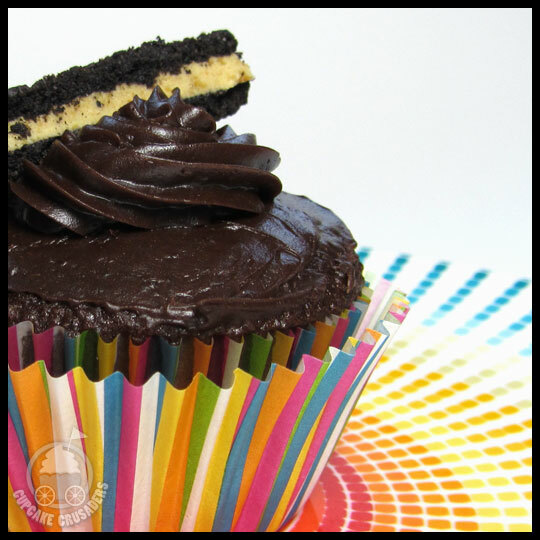 Smooth, moist, with the perfect amount of hazelnut flavor, this cupcake takes the cake. Flying Monkey has such consistent frosting, I always know I will love it. Granted, it is very buttery, so if you prefer a sweet frosting, you may not love it as much as I do. The chocolate cake was moist and not too sweet with wonderful flavor. This wasn’t my first time at Flying Monkey, but it was my first time trying the chocolate hazelnut, and it won’t be my last. The true “cherry on top” was the free button I received after checking in on FourSquare! They only had two holiday buttons left and Mike helped me pick the holly berry red velvet; fitting for the Red Velvet Crusader. After a trek back to the car and a 40 minute ride down to Longwood Gardens, we walked into a winter wonderland of snow, trees, and holiday decorations. Along the east path, right next to the Canopy Cathedral Treehouse, Mike stopped to get a pebble out of his shoe… or so I thought. After I decided to sit, he stood to tell me how much he loves me and then got down on one knee to ask me to marry him!! 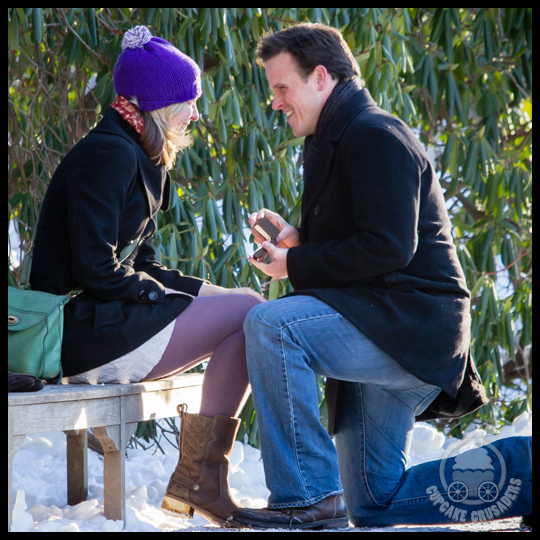 On top of surprising me with the proposal, he had our good friend and professional photographer, Ken Adam, there taking pictures the entire time! We are so lucky to have photos of our special moment. As if a lovely day in Philly and a proposal at Longwood Gardens wasn’t enough, Mike then swept me off my feet and back to Baltimore where we had dinner at one of my favorite restaurants, Salt. But Mike had one last secret up his sleeve, so we headed down to Fell’s Point and walked into my favorite bar, Max’s. There waiting for us was a huge crowd of our friends! As you can see from the picture, I was shocked to see so many people! 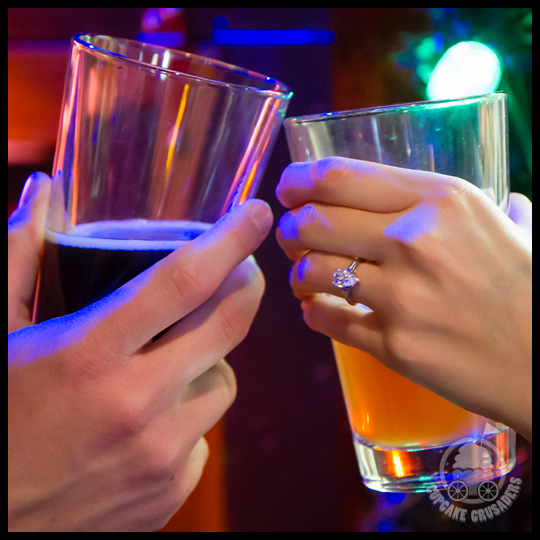 Cheers to a wonderful Valentine’s day! Special thanks to: Mike, who made our day so special. Ken, for taking amazing photos. My brother Richard, for being there, always. And to all my friends (from near and far, Alli!!) who made it out to celebrate. Two stops into our roadtrip tour we Crusaders felt like we won the cupcake jackpot! 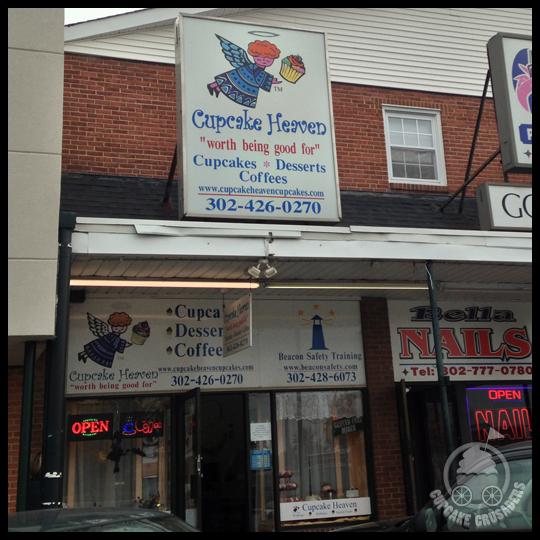 Great cupcakes, cool shops, and even a little brewery break set the bar pretty high for our last stop, Cupcake Heaven in Wilmington, DE. (you can read those first two reviews here and here). Following the GPS to the shopping center, things started to look oddly familiar. As we parked, I knew this was not my first time at this cupcake shop. 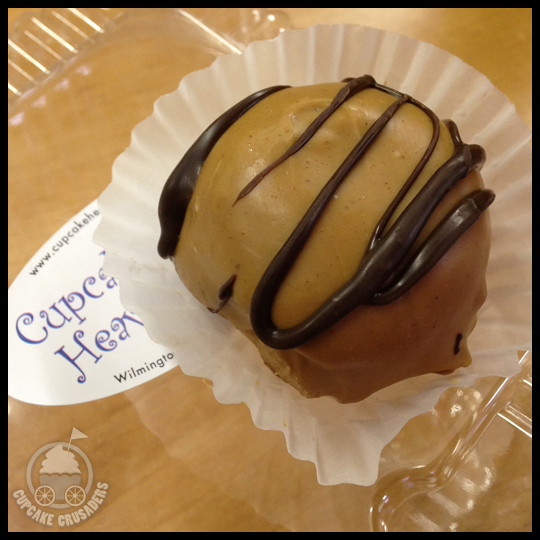 A friend lives near Wilmington and we stopped by Cupcake Heaven during one of my visits. Honestly, I was hoping this experience would be better than my first… so we walked in and I wiped the opinion slate clean. Cupcake Heaven had a variety of cupcakes to choose from. The staff was helpful, but didn’t seem enthused to be working. After making some difficult choices, we sat to try our flavors. 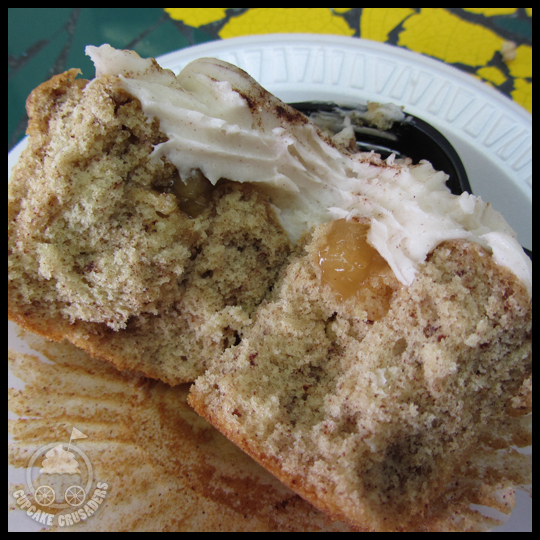 Stacy’s Cinnamon Apple cupcake looked pretty appetizing, but was a complete disappointment. The cake was incredibly dry and the frosting was “blah.” The only redeeming quality of this cupcake was the filling, unfortunately there was very little of it, making for an overall sad cupcake experience. Jenn was weary of her cupcake after seeing Stacy’s reaction… but as a true Crusader would, she trekked on and tried the Mint Chocolate Chip cupcake. The chocolate cake was very dry. And the frosting, while oddly bright, was surprisingly smooth and had great mint flavor. The best thing about this cupcake was how much Leah loved the frosting. 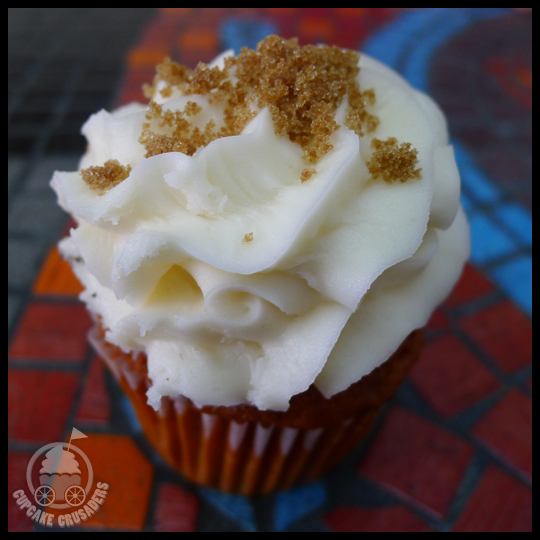 My sweet potato cupcake looked fantastic, but tasted like cinnamon cardboard. The frosting was too sweet and didn’t have much flavor, while the cake was a crumbly mess. After years of eating cupcakes all over the spectrum from good to bad, this one sticks out as one of the worst. Confirming that my first experience wasn’t a fluke. 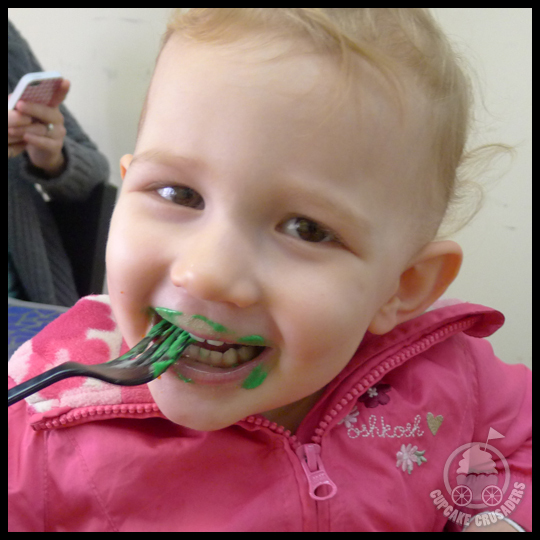 Overall, our cupcake roadtrip tour was a HUGE success! We enjoyed our stops along the way and while not everything was perfect, spending a whole day together is always a great time! This was the first of our cupcake and cocktail combos. The cake was light and airy, as angel food cake should be. The cocktail was so delicious that Crusader Stacy said it was, “probably the best drink I’ve ever had!” Even though this was a frosting-free cupcake, the pairing worked well together and was certainly a great start to the evening. This chocolate cupcake topped with white chocolate mousse and drizzled with salted caramel was AMAZING! Not too sweet, and the little bit of saltiness was perfect! The chocolate martini cocktail was smooth and sweet with the perfect alcohol zing. This cupcake was interesting. Not a typical dessert cupcake in flavor or texture, this cupcake was good, once you knew what to expect. It was a tasty and an interesting take on a cupcake and cocktail pairing. Both our friend Beth’s and my favorite of all the cupcakes, this sweet corn cake was amazing and tasted a bit like caramel corn. 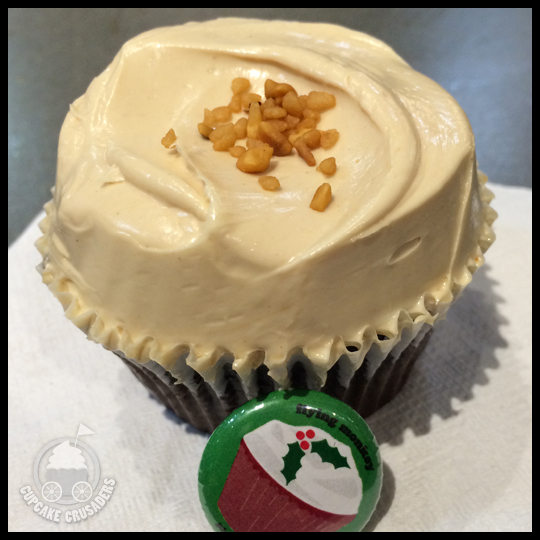 The maple iceream alone was wonderful and with a STACK of homemade caramel corn on top, it is a cupcake that still stands out to me today! This cupcake was very good, with a lightness that paired well with the cocktail. Lemony and fresh this was a cupcake that we would love to try again. 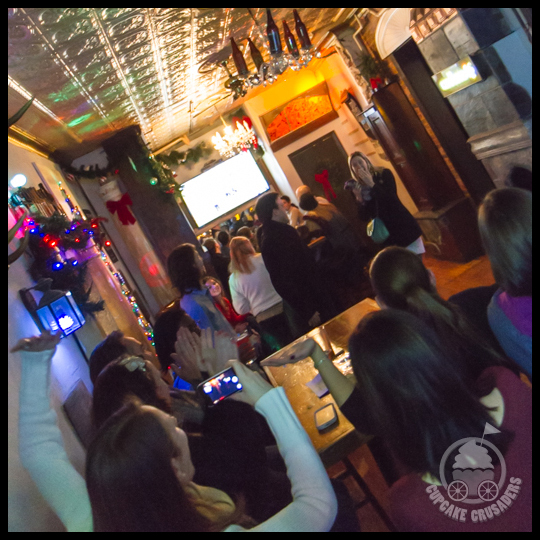 We Crusaders still enjoy going to Pazo, and try to stop by when we are in the Fell’s Point/Harbor East area. They have fantastic food, a too cool atmosphere and comfy couches. On a recent visit, Crusader Stacy and I ended up there late night, sipping unique cocktails and catching up. With or without cupcakes we love this Baltimore gem… if only they would bring back Cupcakes & Cocktails! 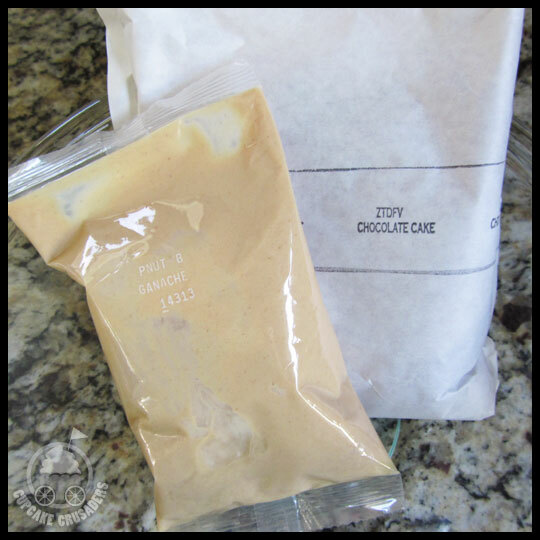 Taste Test: How does Chef Duff’s Cake Mix Compare? We haven’t reviewed Baltimore local, Chef Duff of Charm City Cake’s, line of cake mixes and frosting yet because, to be honest, they are a bit pricey compared to the competition. The retail price for the above is $5.69 for a box of cake mix and $3.29 for a tub of frosting (I’m sure prices vary by location). On sale, I picked these up for $3.49 and $2.99, so still not super cheap. The box of mix did come with a large packet of pre-made peanut butter ganache though, so I was glad to see they hadn’t skimped on that. Even though we’ve heard that Chef Duff is not a fan of the cupcake frenzy (crazy, I know! ), I decided to use this mix to make cupcakes instead of a layered cake. Take that Chef Duff! (Kidding! We actually really love him, his show, and that he calls Baltimore home). 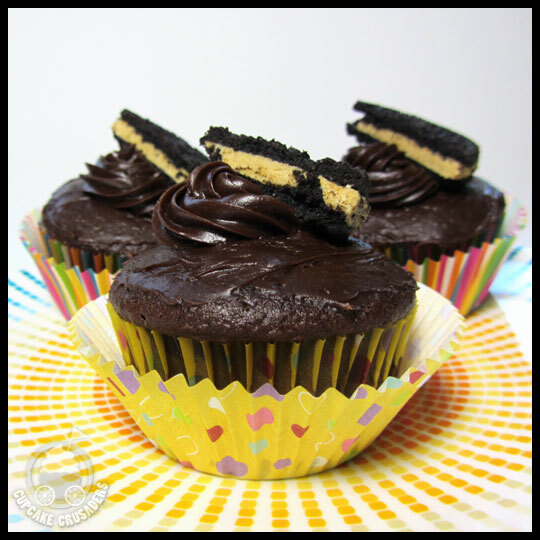 In order to provide you all with an accurate review of the product line, we didn’t modify this mix or frosting like we normally like to do and the only “extra” thing I decided to purchase was Peanut Butter Oreos to add on top (if you haven’t had these, what are you waiting for? Seriously, run to your nearest grocer). When I mixed the batter according to the directions it appeared very runny and the dry ingredients didn’t seem to mix easily in with the wet, causing little chunks throughout. Shrugging this off, I filled the baking cupcakes and set the timer on the oven. The instructions called for 20 to 25 mins, but that seemed really high to me, so I decided to bake for 16 minutes (my normal cupcake baking time) and add more time if necessary. I’m glad I did that because they were completely finished baking when I checked them. Once they cooled, I cored the center and added the peanut butter ganache. 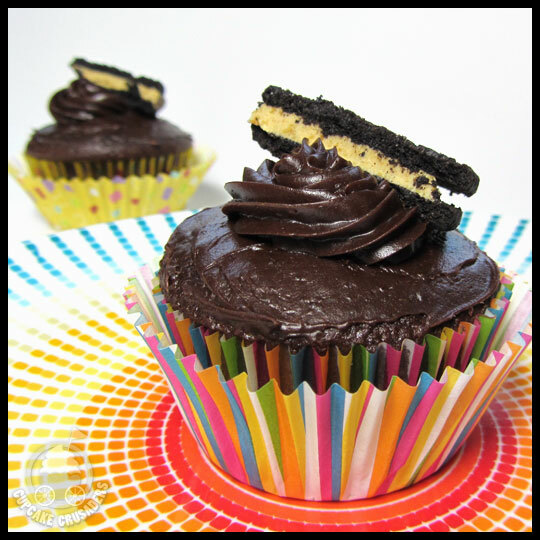 The texture of it was perfect for the filling, and the bag it came in made filling the cupcakes easy and mess free. Since I was filling the cupcakes, I didn’t chill the ganache as the box suggests, but if you are going to spread it on a layer cake, I definitely think you should. It might be too runny otherwise. 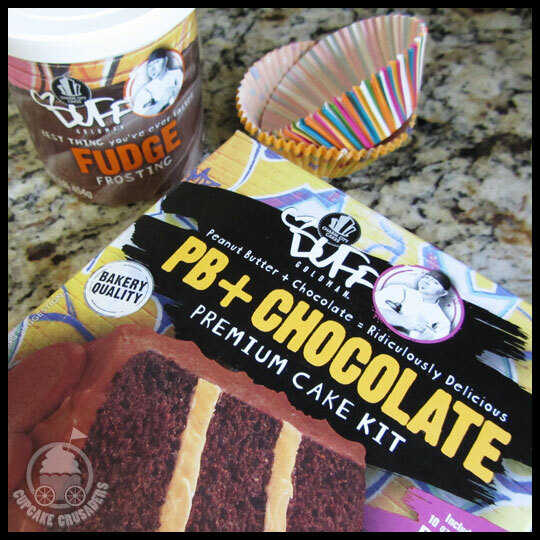 Before I frosted the cupcakes, I did a little taste test of Duff’s Chocolate Fudge Frosting, and was glad I did. It was really rich and overly sweet, like typical pre-made store bought frosting. I decided a thin layer with a dollop on top would be the perfect amount. Overall these cupcakes were good. Not great. Not Special. Just good. Although, I was able to get 25 cupcakes from the mix, while with other brands I’m lucky to get 22. Also, it was nice to have something included in the box to use as a filling, but in my opinion the cake and frosting were just as good as any of the competitors’. I’m not sure if I would seek out Chef Duff’s mixes in the future. I may pick up a box from time to time, if they are on sale and I fall into the gimmick trap again, but otherwise I think I’ll stick with my old friends, Duncan Hines, Betty Crocker, and Pillsbury. 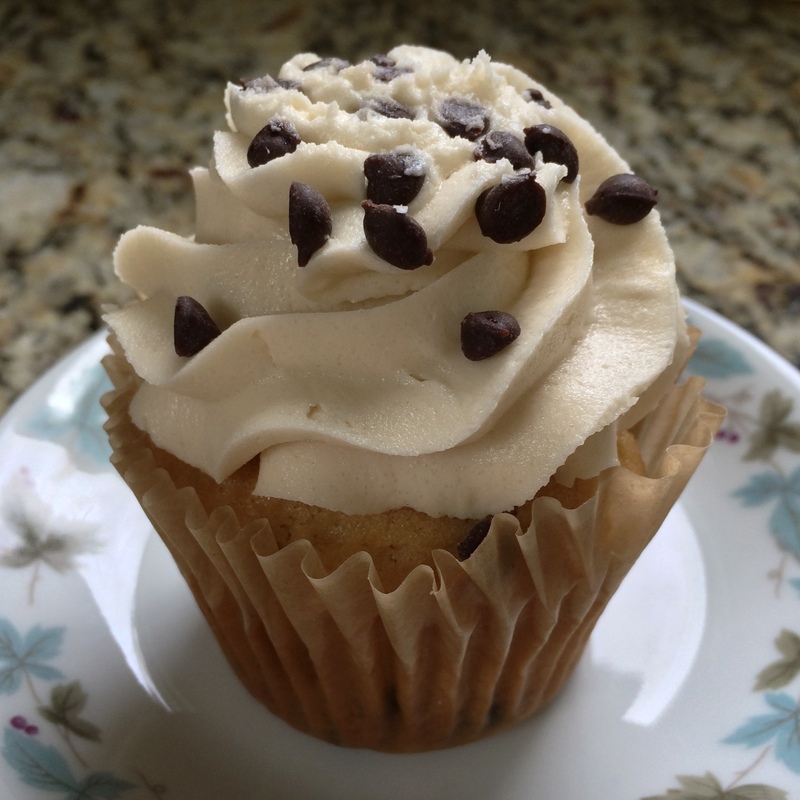 Charm City Cupcakes – Are New Locations Impressing New Neighbors? Engelia, from Key Events, is a new friend to the Crusaders. 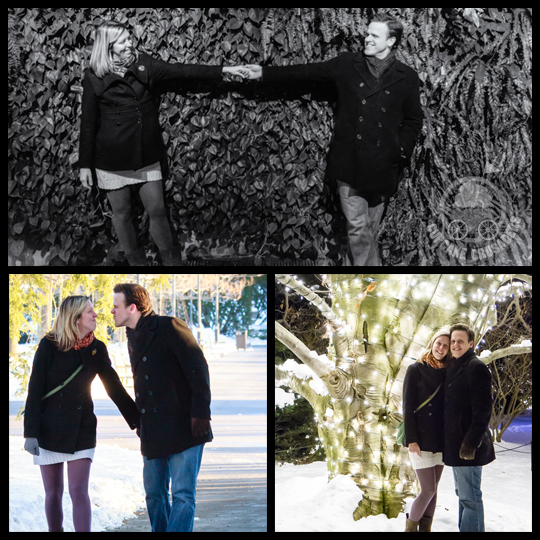 We met at church and quickly discovered a love for a couple of things: Reality TV and cupcakes! I later found out that Engelia is also party lover and expert at DIY. This lead her and a friend to start Key Events – Boutique Event Planning. Check out their website…You’ll find beautiful wedding cupcakes in their gallery. 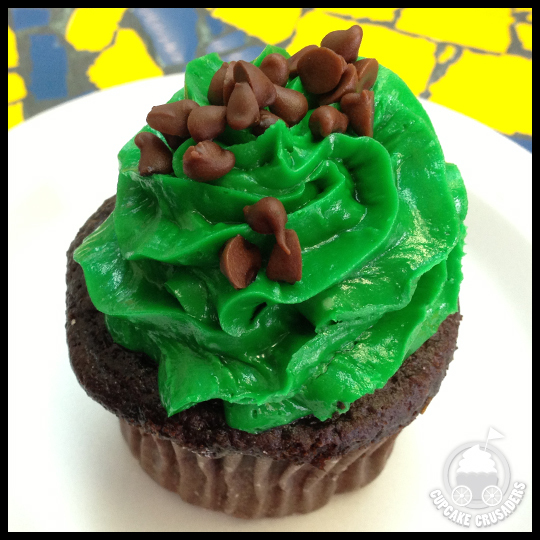 Today, Engelia is sharing a review of Charm City Cupcakes’ new location in Owings Mills, MD at the Valley Village Shoppes. Thanks, Engelia! In the process of running around town picking up food and decorations for a “manly” themed birthday party, I stopped at a stoplight across from the Valley Village Shopping Center in Owings Mills, MD. A sign caught my eye that read “Charm City Cupcakes.” I live in the area and pass this center at least five times a week and knew that this was a new addition. As I pulled into the parking lot and parked, my heart sped up at the anticipation of a new dessert hitting my lips and maybe even making an appearance at this “manly” birthday party. Charm City Cupcakes is a well-known bakery in the MD area. With three locations including a flagship store at the Inner Harbor in Baltimore, they have a new location at 9101 Reisterstown Rd. Owings Mills, MD 21117. Out of all of their choices, I selected the red velvet cupcake (one of their Charm City Classics as listed on the menu) with a cream cheese frosting and a chocolate mousse filling. They require a minimum order of six cupcakes. I placed an order of six cupcakes for pick up the day before the party. Side note: I did not order more as 1) this was my first time ordering from Charm City Cupcakes and wanted to minimize loss if the cupcakes were not enjoyed and 2) I’d just picked up a dozen cupcakes from Giant. Basically, I’d already filled my cupcake party quota with the Giant order but thought it would be a nice surprise for my client. The pickup went smoothly and the associate behind the counter was the same woman who helped me when I placed the order. She was very pleasant and was able to call the owner directly with any questions. The cupcakes were placed nicely in a white box. I placed the treats in the refrigerator overnight and prayed that they did not dry out. Party Night! I placed the six cupcakes out on a glass display. 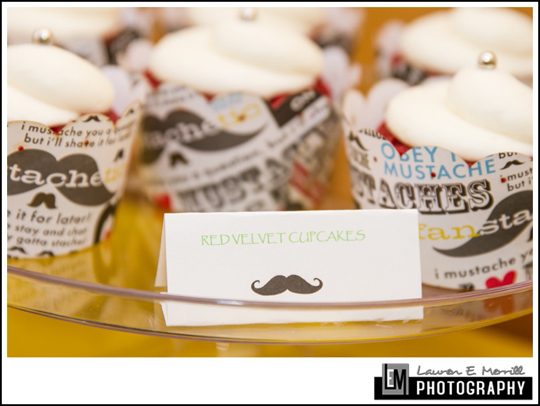 I wrapped them in moustache themed cupcake wrappers and placed a moustache ring on top of the cupcakes. Long story short, I had to swipe one of the cupcakes about an hour into the party so that I could try it later. As I listened to guests enjoy the cupcakes, there were mixed reviews. A couple of guests commented on how smooth the chocolate mousse filling was and made a great pairing with the softness of the cupcake. Another guest did remark that his cupcake was a little dry and the frosting too sweet. I quickly interjected that the dryness most likely had to do with the fact that I refrigerated them overnight. My thoughts: I finally got to try the red velvet cupcake around 11:30pm that night. The cupcake was at the perfect temperature as it’d sat out for about two hours. I have to let you know that the red velvet flavor is my absolute favorite and I’ve tried it in pretty much every way possible from cake pops to cakes to cheesecake to doughnuts. Often, if not mixed and baked properly, the essence of the flavor can be easily dried out. Charm City Cupcakes did a good job of preserving the center of the cupcake and incorporating the filling. The center was soft and moist. The top of the cupcake was a little hard around the edges but was offset by the softness of the cream cheese frosting. The cream cheese frosting was semi-sweet. I tend to like my frosting a little less sweet but as we know everyone is different. Overall, I would have liked the cupcake to be moister at the top and a less sweet frosting but I’m more than open to trying their other flavors and recommending them to others.